Where is the default mode network? 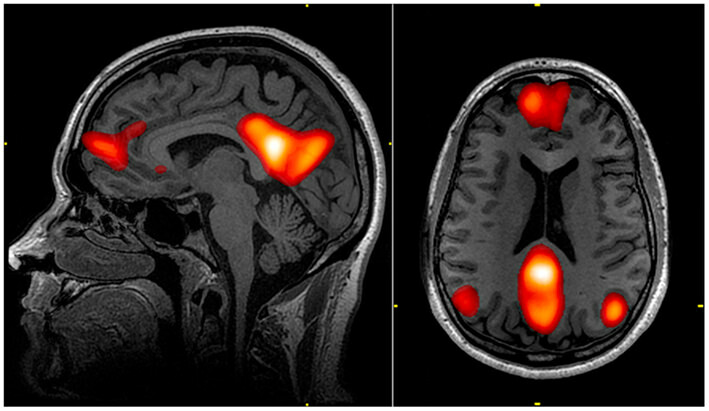 Functional magnetic resonance (fMRI) image showing activity in the default mode network. The default mode network (sometimes called simply the default network) refers to an interconnected group of brain structures that are hypothesized to be part of a functional system. The default network is a relatively recent concept, and because of this there is not yet a complete consensus on which brain regions should be included in a definition of it. Regardless, some structures that are generally included are the medial prefrontal cortex, posterior cingulate cortex, and the inferior parietal lobule. A few of the other structures that may be considered part of the network are the lateral temporal cortex, hippocampal formation, and the precuneus. What is the default mode network and what does it do? The concept of a default mode network was developed after researchers inadvertently noticed surprising levels of brain activity in experimental participants who were supposed to be "at rest"--in other words they were not engaged in a specific mental task, but just resting quietly (often with their eyes closed). Although the idea that the brain is constantly active (even when we aren't engaged in a distinct mental activity) was clearly expressed by Hans Berger in the 1930s, it wasn't until the 1970s that brain researcher David Ingvar began to accumulate data showing that cerebral blood flow (a general measurement of brain activity) during resting states varied according to specific patterns; for example, he observed high levels of activity in the frontal lobes of participants at rest. As neuroimaging methods became more accurate, data continued to accumulate that suggested activity during resting states followed a certain order; this data was easy to come by because in many neuroimaging studies, asking participants to rest in a quiet state is considered the control condition. In the early 2000s, Raichle, Gusnard, and colleagues published a series of articles that attempted to more specifically define the areas of the brain that were most active during these rest states. It was in one of these publications that they used the term default mode to refer to this resting activity, phraseology which led to the brain areas that exhibited default mode activity being considered part of the default mode network. Thus, the default mode network is a group of brain regions that seem to show lower levels of activity when we are engaged in a particular task like paying attention, but higher levels of activity when we are awake and not involved in any specific mental exercise. It is during these times that we might be daydreaming, recalling memories, envisioning the future, monitoring the environment, thinking about the intentions of others, and so on--all things that we often do when we find ourselves just "thinking" without any explicit goal of thinking in mind. Additionally, recent research has begun to detect links between activity in the default mode network and mental disorders like depression, anxiety, and schizophrenia. Furthermore, therapies like meditation have received attention for influencing activity in the default mode network, suggesting this may be part of their mechanism for improving well-being. The concept of a default mode network is not without controversy. There are some who argue that it is difficult to define resting wakefulness as constituting a unique state of activity, as energy consumption during this state is similar to energy consumption during other waking states. Others have asserted that it is unclear what the patterns of activity during these resting states mean, and thus what the functional importance of the connections between the regions in the default mode network really are. These caveats are worth keeping in mind when you come across research on the default mode network, as--especially due to its relationship with meditation--it is becoming a frequently-used term in popular neuroscience descriptions of brain activity. The idea of a default mode network, however, is not universally accepted; even those who endorse the idea concede there still is a lot of work left to do to figure out the network's exact functions. Regardless, at the very least the concept of a default mode network has sparked interest in understanding what the brain is doing when it is not involved in a specific task, and this line of research may help us to gain a more comprehensive understanding of brain function.